When Ari was eleven, we were able to adopt Matt. Such sweet love. This is a glaze on canvas to match the walls. I’ll always remember the time my granddaughter, Elizabeth Ann, all of three years, climbed into my art chair. I rolled it closer to the drafting table, and Elizabeth waited patiently, expectantly, as I pulled out the new box of chalk pastels. Lifting the lid, I watched her eyes widen and she gasped. Her tiny fingers reached toward the brightly colored chalks, those softly colored chalks, and her fingers ever so lightly grazed over them. She was a child in wonder of simple beauties, as we should be. No one taught her to be that way. Her drawing towards beauty was innate, her three-year-old heart was already caressing the pure acts of lovely living. (In the photo above) One June with a houseful of family, E’s little sister Grace–at barely two–wandered into my art room, climbed upon the stool and began painting as though she had been painting for years. Gratefully all she had were dried-out paints and a bunch of brushes. No one had shown her during her rambunctious toddler years how an artist paints with a brush. Fingerpainting in her high chair with catsup and smashed peas had been sufficient until that day. While on my stool painting, Grace was immersed in overwhelming peace. I painted the flowers above that have since traveled with its owners to Antigua, Guatemala. If you want to see authentic beauty living large–meet Rita and Cary Sills. I recently saw them at church (their church for years and now our new one). They were back in the country visiting with their family and church family Fellowship Bible Church in Searcy, AR. After hugs and reminicsing, Rita said she still had the fire screen I had painted for her 15 years before. A week later I received this photograph. Their smiles tell it all. They left their beautiful home and extraordinary son, daughters, new inlaws and grandchildren to be where they believed God was leading them. They’ve always had missionary hearts. Find out more about their ministry work at caryandritasills.blogspot.com. Vida is a design company that contacted me about using some of my artwork on their clothes. Check out the website here and tell me what you think. Some of my butterfly designs and travel photographs are now on shirts, t-shirts and scarves. I also love that part of the proceeds are used for an international literacy program. The photograph of the roses on the Vida post was taken when we visited Powerscourt Castle, outside Dublin, Ireland. The main page was taken in a most favorite place–Standing on a hillside in Bellagio, Italy, overlooking Lake Como and the base of the Swiss Alps. 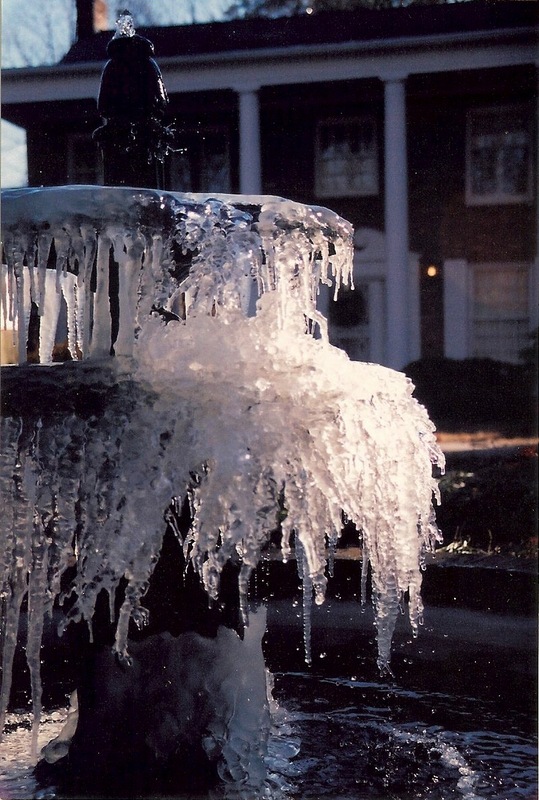 The fountain in our front yard reminds me each winter we all have frozen times in our lives, times when we’re meant to be still, when time stands still. Yet, once we look closely, more intently, we’ll discover life still flows, deeper, stronger it flows. 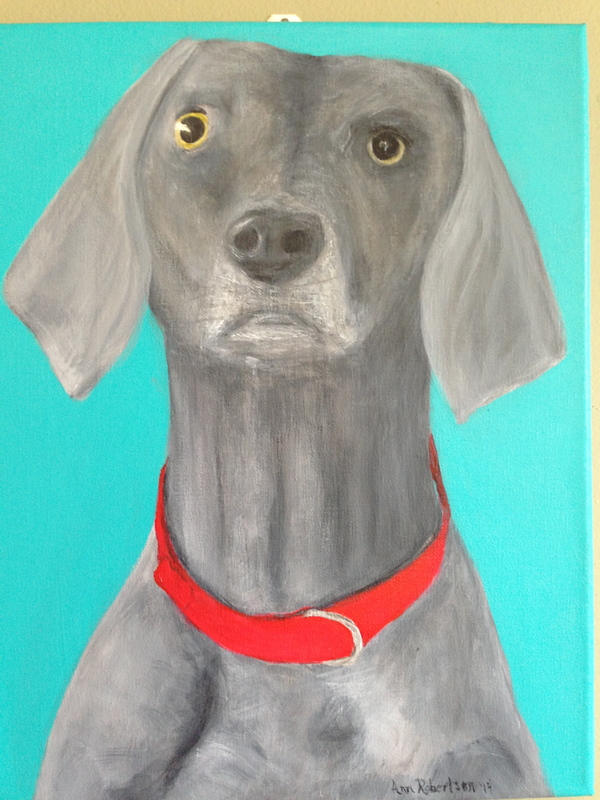 This 11″ x 14″ acrylic was commissioned as a gift to honor a dear family dog’s life. Abby was a happy dog with a sad face. Not sure how that works. She simply took her life’s purpose seriously, obligated to defend her family, eat everything voraciously set before her and sleep wherever humans sleep, just hours more. In June, Bill and I had the pleasure of traveling to Oregon and Idaho as we check off visiting each state together. We have 13 states left. 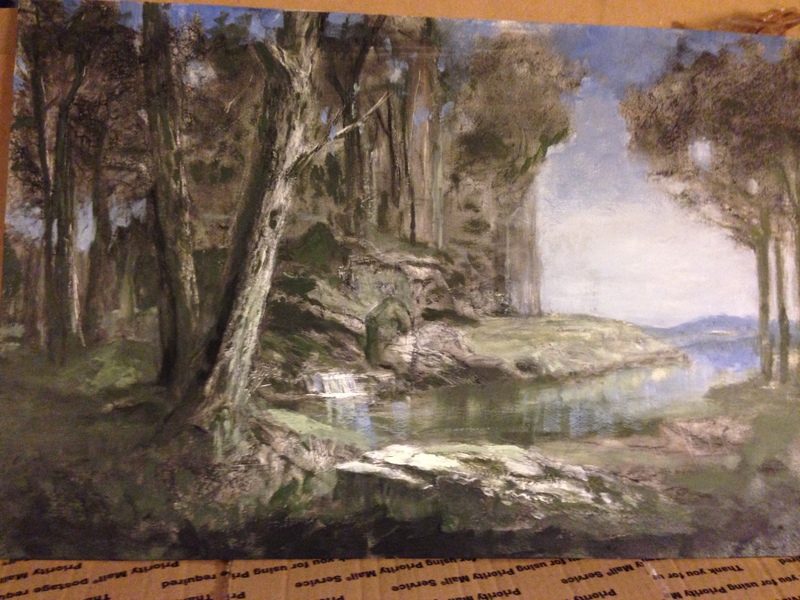 I spent five days attending an art workshop taught by Frank Covino and getting to know some of NW America’s best. The 16″ x 24″ oil landscape I began at the workshop is still incomplete, but I share it with you so you can see it as a work in progress. So like us, huh? Some artwork I’ve done–oils, watercolor, pastels, polymer clay and photographs–continue below. It is from the series: Openings & Closings, Windows & Doors, Opportunities & Venues into What God has in Store. 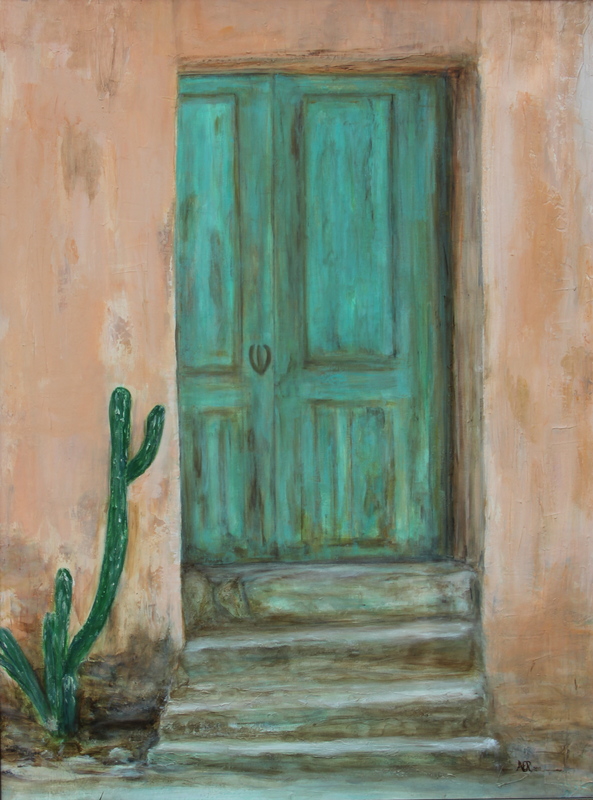 The door was painted from a photo I took while on a cultural art exchange with the mayor of San Miguel del Allende. This beautiful European-like city is filled with art galleries and a Gothic cathedral that draws an international crowd. The door to this house was on a mountainside that overlooked the city. You are one talented lady. So glad to know you! This couldn’t be any more cheerful and beautiful!!!!!!!! Love it. Thank you. It was freeing to just let the paint flow. I understand now why we see adult artists doing childlike whimsical artwork! Einstein is adorable. He loves getting his paws on everything. Once he painted the drafting tables and floors with those four cute paws. Emily, if you need a paint cat, I could send you one of ours! I love the paintings. My favorites are of your yard, home, and you/Bill at the game!! Your talent and your words bless me in so many ways. Thank you, Linda. Coming from you, such an accomplished artist, that means a lot. Hope you are busy painting.